Last night, NYC DOT presented a plan for painted bike lanes and sharrows on Park Slope’s Seventh Avenue, which the Brooklyn Community Board 6 transportation committee voted for 9-2 [PDF]. Agency reps also unveiled their version of the “Amity Street Wiggle” [PDF], but the committee voted 9-2 to table it until DOT has finalized signage and conducted more outreach on nearby streets. 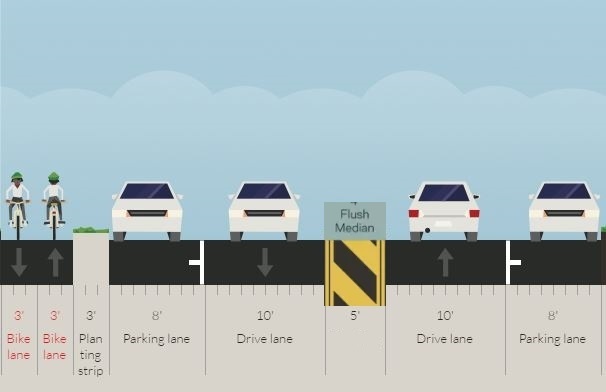 The Seventh Avenue project would add painted bike lanes between the parking lane and general traffic from 23rd Street to Carroll Street, and sharrows from Carroll Street to Park Place. The arrangement is basically identical to nearby Fifth Avenue, which is the same width as Seventh. Many people last night expressed a desire for a more ambitious redesign. But DOT Bicycle Program Director Ted Wright said a two-way protected lane on the corridor would only be possible with the removal of a parking lane or conversion of car traffic to one-way flow, and that doesn’t seem to be on the table. Over by Court Street, Bahij Chancey, Ian Dutton, and other members of Transportation Alternatives’ Brooklyn activist committee had proposed a “wiggle” to allow eastbound cyclists on Amity Street to jog briefly against traffic to get onto Dean Street, a key route extending across much of Brooklyn. DOT now has an official plan to make that happen. The DOT version calls for a painted bike lane on Amity between Henry Street and Court Street, transitioning to sharrows on Dean Street, which turns into a bike lane a few blocks east. It does not include a pedestrian refuge at Amity and Court like the volunteers’ proposal, but it does have a new crosswalk on Court Street to give pedestrians a route without the potential for conflicts with people on bikes. “We’re really establishing this as one intersection,” Wright explained to the committee. DOT’s proposal (left) differs slightly from the one designed by Ian Dutton and Bahij Chancey (right). Committee member Jerry Armer motioned to table the plan until DOT conducts outreach in the Cobble Hill neighborhood where the project would be implemented (as opposed to last night’s meeting, which was Park Slope). Other committee members wanted to hear more from DOT about the signage that would inform drivers, pedestrians, and cyclists of the unique street configuration. The transportation committee will consider the project again at its meeting next month. Right in some US cities, wrong in New York. When you fail to put them in the center of the lane as NACTO recommends they direct people to cycle in the door zone and incite drivers to harass you if you don’t. It seems to me that a 6th Ave-S. Portland bike boulevard is the ONLY way Park Slope is going to have remotely comfortable cycling other than on Prospect Park West. Without the will to remove parking there is no other tool to possibly accomplish this. 5 foot bike lanes on the drive-side of car parking are not going to do it. Q: How many times will this bike lane disappear to accommodate left turn lanes (or be intruded in by oblivious drivers going around someone waiting to turn left if they don’t put in a left turn lane)? A double parking lane. How adorable! “Many people last night expressed a desire for a more ambitious redesign. Ted Wright is either lying, or an incompetent when he says that a protected bike lane cannot be implemented without eliminating parking. This street featured narrower lanes, which encourage drivers to obey the speed limit, thereby both reducing fatalities and reducing the fines paid to the city for speeding. While not ideal, it is better than then proposed 12-foot lanes which encourage drivers to speed. This is an excellent proposal and a good news for all the cyclists out there. I hope bike lanes for bikes like Trek, Giant, Morpheus bikes and others will be protected and accomplished.